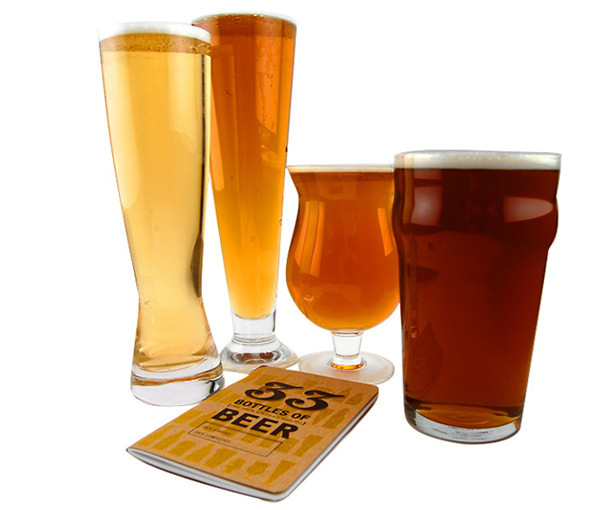 While every type of beer has its special glass, you’re probably not going to have them all. So there’s the Connoisseur Collection, which comes with the basics for any beer lover and a cute little tasting notebook. Tim Parsons’ black half pint glass has a sleek look and protects your cold beer from your warm hands. 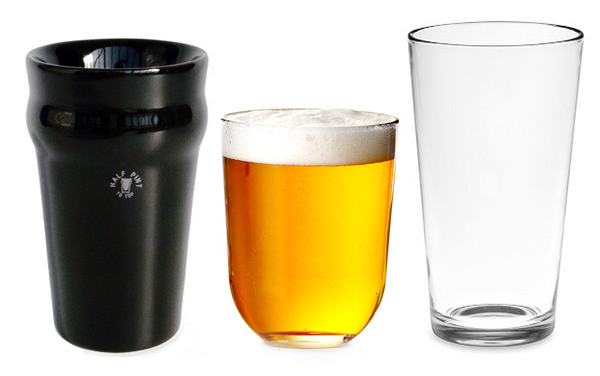 For a little more than a half pint, there’s the Opus rounded beer glass. A conical pint glass is a classic choice (and this one can be monogrammed). The Bodum Assam double-walled cooler/beer glass combines a sophisticated look with practicality. If you want to bring the pub experience home with you, there’s a British style Imperial pint glass and the iconic dimpled beer tankard (far right). A less traditional (but gorgeous) choice is the Step Telc black tumbler, made from mouth-blown Czech crystal. Moving from beer to harder stuff, these fun Rikke Hagen glasses look like spinning tops but were designed to heighten the experience of drinking a fine liquor. Though Hagen was inspired by Cognac, the design would also serve a scotch whisky well. 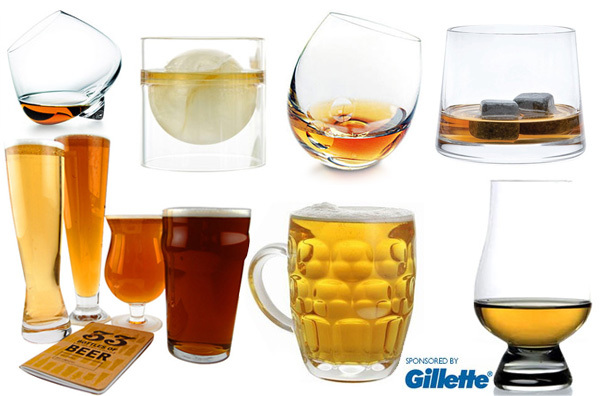 And there is so much amazing glassware that makes drinking scotch (even more) fun! The Boules tumbler and the Eva Trio whisky glass start you off on a stylish tilt, while the Dizzy Diamond tumbler adds another touch of elegance to your encounters with whisky. 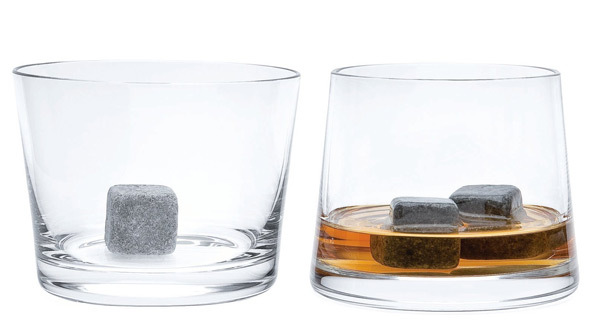 Of course, no discussion of whisky glassware is complete without mentioning Avva tumblers with whisky stones. These tumblers are just so satisfying to look at and hold, and the stones keep it “on the rocks” for those who prefer not to have ice dilution as a part of their scotch imbibing. 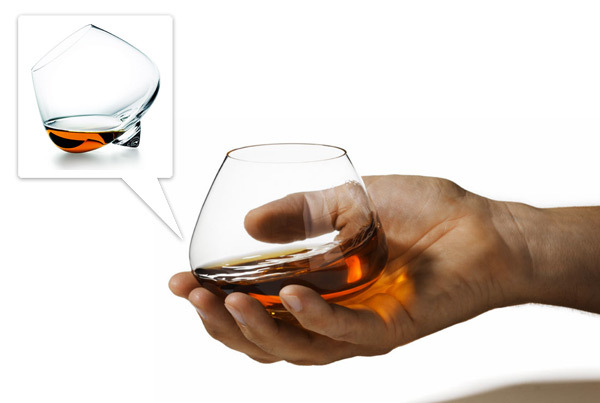 These float cups are a playful choice for serving up your whisky, while those in the mood for something more traditional but equally beautiful can go with the Intermezzo Satin whiskey glass, Glencairn glass or a Reidel sommelier whiskey glass.